Book Description: Making cheese at home is one of the joys of a self-sufficient lifestyle along with gardening canning and raising chickens. 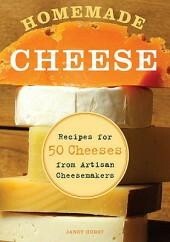 Author Janet Hurst is a twenty-year-veteran home cheesemaker who shows you how to easily craft your own cheddar feta chvre mozzarella and 50 more cheeses. Included are profiles of 20 artisan cheesemakers from Cypress Grove Vermont Butter and Cheese Shelburne Farms Does Leap Pure Luck and more and their favorite recipes. From the Back Cover: Here is everything you need to know to make cheese at home! The expert advice from experienced cheesemakers includes easy and basic recipes for butter yogurt mozzarella and chvre to advanced step-by-step how-to advice on the use of molds and aging your cheeses--from cheddar and brie to feta blue cheese and more artisanal cheeses. And there`s directions for crafting cheese with cow goat or sheep milk. Author Janet Hurst is a twenty-year veteran home cheesemaker and educator as well as a goatkeeper. Plus 20 established artisanal cheesemakers share there hard-won advice recommendations and favorite recipes.